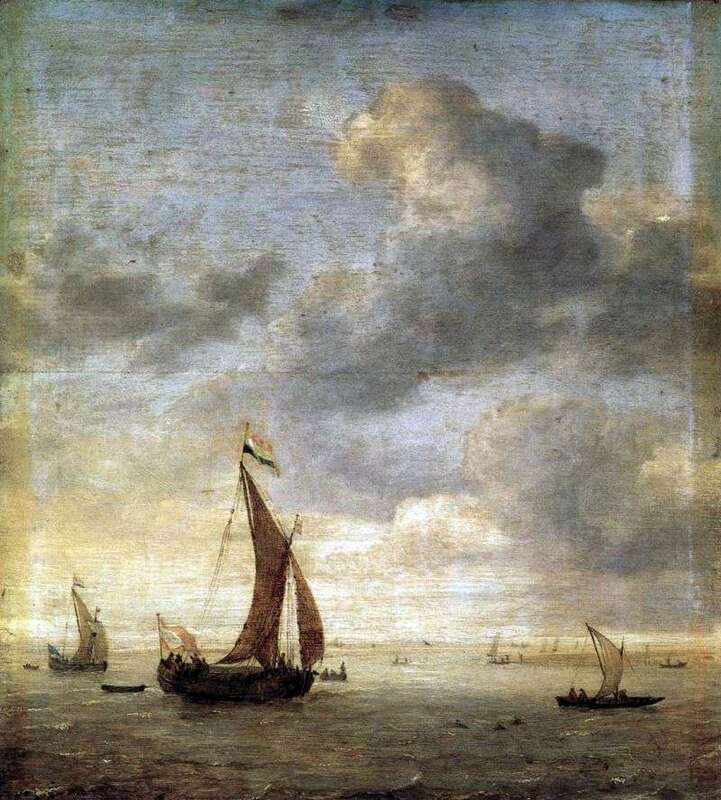 The name of the painter Jan Porsellis is connected with the creation of the Dutch sea landscape in the 17th century. The artist was born in Ghent and began his creative work in Antwerp. In 1617 he received the title of master. In the 1620s, Porcellis worked in Haarlem and Amsterdam, and around 1626-1628 he moved to Zuterwaud and lived there until the end of his days. For the early Dutch marines, executed before the appearance of the works of Porsellis, there was a characteristic fragmentation of the composition, diversity of color. The artist essentially reformed the genre, creating a harmonious picture of the life of the sea. The attention of Porsellis was attracted by the transmission of the changeable light-air environment, the sea horizon connecting the sky and the sea, in the image of which he used Receptions of subtle color gradations. Solving the problem of color, the master carefully studied the effects of light reflection on the sea surface, looking for ways of transmission in the painting of the natural marine glow. The desire to create realistic works was reflected in the image of ships and boats, in which the artist with amazing thoroughness wrote everything down to the smallest detail. Other famous works: “The sea with the ships in inclement weather”. Hermitage, St. Petersburg; “Storm on the sea”. 1629. Old Pinakothek, Munich; “Seaside”. 1636. National Maritime Museum, Greenwich; “Stormy Sea at Sunset”. Hermitage, St. Petersburg. Description and meaning of the painting Sailing on the sea on a windy day by Jan Porsellis.